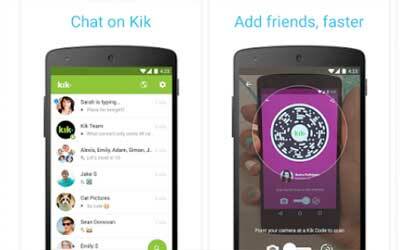 Kik APK 10.12.1.8849 is a messaging application that allows you to communicate with your friends and families easily. It was released at April 2010. Compared to other messaging application, Kik has various features. It does not require pin code as it goes at Blackberry Messenger or phone number as it goes at WhatsApp. Instead, it only requires e-mail address to stay connected with your contact. However, when you do the registration, it requires your phone number. You can do individual or collective conversation. Sending pictures and videos is processed faster. It has no irritating advertisement that might disturb your chatting. The best thing about this application is that it consumes small spaces on your memory. Kik is compatible for various operating system platforms such as Android, iOS, Symbian, Windows7, and Blackberry. To stay connected, you can use either wireless connection or 3G. Your identity is displayed by nickname and profile photo. Kik offers capability to change who can see your identity. Therefore, you can limit the viewer into either public or friend only. Besides chatting with your friends and families, you can also play puzzle game with them. You can chat to new people by send them a message. You will be notified whether your chatting request is accepted or denied. If the system of this application is too complicated for you, you can ask the Kik Bot several questions about it. This feature tells you about the basic guide on how to use this certain messaging application. Additionally, if you feel bored, you can ask Kik Bot to tell you hilarious jokes. This features will not asked you about your personal information. Despite the distinctive feature it has, Kik is capable of running smoothly in Android devices. Kik for Android is certainly an advance messaging application that has various features for your convenience.